After months carefully healing up from a broken wing, Duck finally snuck back into the air a little over a week ago, taking a quick spin in his freestyle wing to make sure everything felt right. Well I guess it did, because last week, at the first sign of good cross country weather, he was right there charging across the bay and all over our back yards! It sure is great to have him back. Thursday started off windy and showery. The forecast was for E 10-20 which often means it'll be gusty within that range. But this time it actually meant it would start out 20 and end up around 10 by the end of the day! At the first sign of clear weather, Thom raced up the hill without telling anyone. 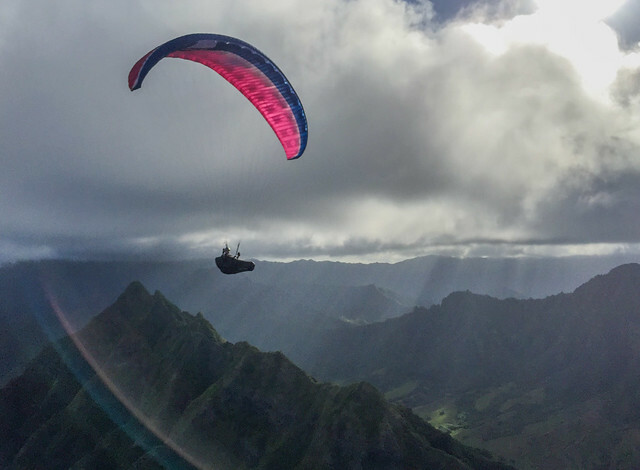 After crashing anonymously and spectacularly over the back of low launch, he got airborne and flew for a long grumpy four hours, covering almost 25 miles of distance, looping twice over a 6 mile span between Kualoa and Punaluu, for 57 points, his second highest score of the year. I eventually made it out there and flew both circuits of that chronic loop, with a very long top landing in between to lay my gear all over launch and help Anne and Matt get airborne. For my second flight I tagged along with Thom to Punaluu, and soared high over Puu Piei with new P2 pilots Steve Lynch and Marc in the most gorgeous evening light. Duck surprised us by running up to join us midway through our adventures, and he blazed across the bay with Miami Eddie in pursuit. The two of them ended up continuing their mission all the way to Waiahole! What a nice way to return to cross country flying. Dorothy was able to pick them up on her way home from work. We were also joined by Richard from Japan and Michael from Switzerland. Friday started off light and thermic. Drew was up first, scratching and thermaling, and he top landed to greet the rest of us as we arrived on launch. He said the thermal over the saddle was extra fierce today, trying to fold his wing into interesting shapes. That got me super excited. Woody, Drew, Colorado David and I launched and played with some pretty strong thermals over the ridge. I got almost three grand and headed across the bay, climbing up over there in nothing but thermals. My favorite kind of day! I thermaled up over Kualoa and over Hakipuu before returning and heading to Sacred Falls and then to Hauula. But from there it turned into a stronger day. The forecast once again was for E 10-20 but this time it seemed like we'd started at 10 and would move to 20! I battled my way back to Kahana to find my wing man Duck launching to join me for another round. Hooray! We flew to Kualoa together and then sped back past Kahana all the way to Duck's personal landing zone at Hauula Beach Park. Thanks to Allegra for bringing us back! Also flying were Steve, Marc, Steve Lynch, Utah Ed, Lake and Gaza. I had been in the air almost five hours, covering almost 30 miles of distance, looping twice over a 9 mile span between Hakipuu and Hauula, and cracking off a 67 point flight, my second highest score of the year. Two consecutive sweet cross country days made extra special by having our trustiest wing man back in the air with us and charging hard. I guess that just means we'll have to find someone else to drive retrieve all the time! Aw Hell, Now I'm blushing. What a great way to get back in the saddle--chasing my favorite folks around at 2500 feet was great. I especially enjoyed taking Eddie on the bay crossing to MDKS and working on my photo shoot with Alex--what a beautiful place we get to fly! I'm happy to be rehabilitated and able to fly again. Here's to many more!